Sony did its utmost to top Microsoft's Project Natal showcase by putting on display its own motion tracking technology – a controller with a glowing ball at the top that can be tracked by camera. 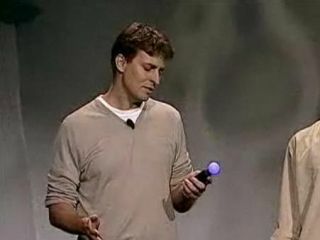 With the odd dig taken at Microsoft's video footage, Sony showed off live tech demos of its motion control in action, insisting that this was a tool of future gaming. An impressive demo of the motion controller - which is more Wiimote than Natal mo-cap - showed the accuracy of the device in much the same way as Nintendo had showcased its Wii Motion Plus earlier in the day. However, the tech demo also included the use of the motion controller as a pen like device to control a real time strategy and to paint and write. It wasn't, in truth, as impressive as Project Natal - although Sony seemed to be pointing out that it was closer to being a reality. Certainly it added a degree of control that a controller does not have - and could prove to be a rival to Nintendo's Wii.